This is sickening, astonishing, sad. What the Massachusetts attorney general seems to portray is a firm that has changed profoundly since its 20th century beginnings. Less the management consulting firm that prided itself on ideas, more a management consigliere firm where anything will be done for a paying client. But here is what most struck me. This standard bit of alleged McK work product. The 80/20 rule. Finding the relatively small number of actors in a system that drive most of the results. In this case, finding especially prolific prescribers of Oxy. Because it shows how these basic management concepts, when applied without a hint of scruple or moral understanding, without a grasp of systems and society, can lead to human catastrophe. 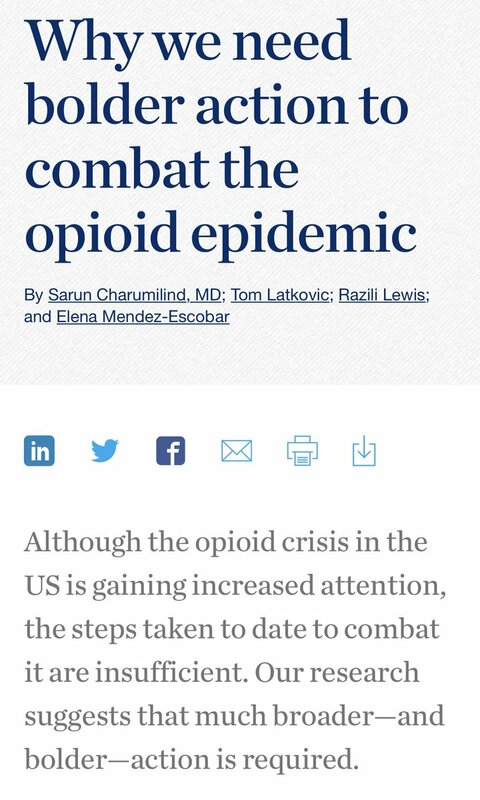 Anyone who knows opioids knows that prolific prescribers may well be fraudulent pill mills. 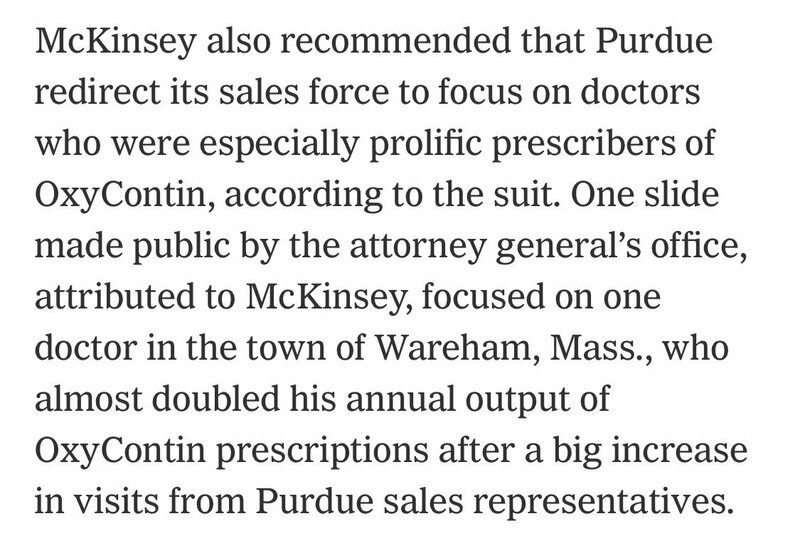 Now picture the young McKinsey analyst being asked to run the numbers on the handful of doctors who drive the most profits. It demands tunnel vision to do that work without seeing what you’re doing. You get lost in the data. Now, it wouldn’t be MarketWorld without one more element. If you’re complicit in causing a major social problem, it has become very fashionable to also be engaged in solving that problem. And, in fact, in trying to lead the solution chase. Hence, this @McKinsey report. Note the arrogance here. It’s not just trying to buy the modern papal indulgence of solving a problem you’re complicit in causing. It’s the McKsplaining. All the people working to solve a problem (that you helped cause) are fools. You (who caused the problem) know best. The arsonists, in other words, must be in charge of fighting the fire. Then you have this chart. 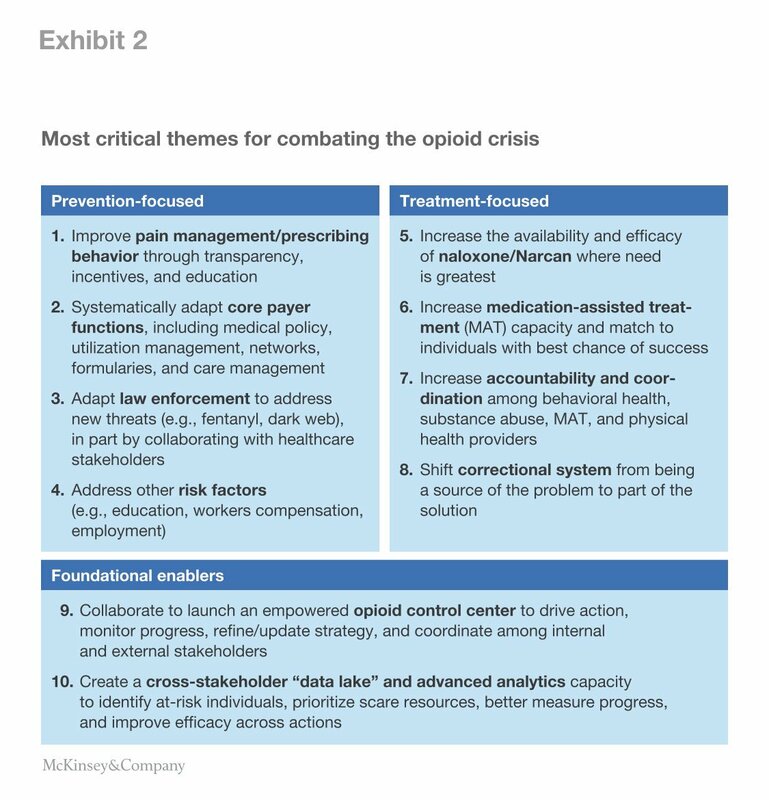 McKinsey advising tactics for fighting the opioid crisis that include some of the same tactics it allegedly advised Purdue Pharma to beat back. This is literally fighting on both sides of a war, with only the good side marketed and made a report. As @waltbogdanich and @PekingMike write, McKinsey chat groups are aflame with anger. People cannot believe what the firm has become. I know a lot of you follow me. I urge you to consider being whistleblowers and contact Walt and Mike via DM or Signal to share what you know. I can vouch for @waltbogdanich and @PekingMike 💯. They will protect your anonymity. But this is the kind of institutional crisis that can only be solved from sunlight and the outside. The window for self-reform has shut.